How far can you drive once your gas light comes on? 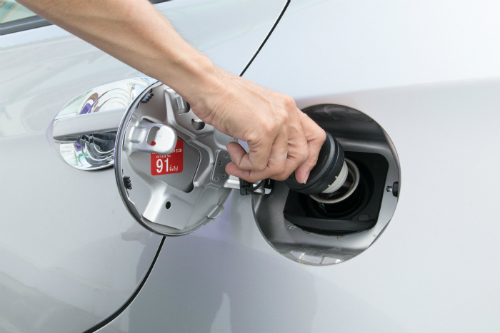 Home » FAQ » How long can I drive my car on empty? While some drivers follow a strict ‘fill up at the halfway mark’ rule for gas, most of us wait until the gas gauge gets pretty close to empty. If that sounds more like you, it’s likely you have gotten in a few close calls where you weren’t positive you would make it to the next fuel pump before things started sputtering. So, just how far can you drive once your gas light comes on? Well, that depends on your vehicle and driving habits. We break it down below. Each different make and model of vehicle has different criteria for when the low fuel light comes on. Some fuel lights come on when the fuel tank has as much as three gallons left to spare while some wait until there is only 1/16th of a gallon left. To know for sure how much fuel is left in the tank when the fuel light illuminates, you will need to check your owner’s manual. Though, most vehicles should offer at least 25 miles of driving depending on your driving conditions. Getting stranded on the side of the road isn’t the only danger when you let your fuel tank run low. Any debris in your gas tank will automatically sit at the bottom of your fuel reserves. When your tank is almost empty, that dirty fuel will be sent through the fuel line potentially causing harm to your engine or fuel pump. If you do find yourself on empty and are trying to make it to the next station for a fill-up, there are some driving habits you can adjust to get the most of every last drop left in the tank. First, try and maintain a steady speed without slamming on the brakes or accelerator. Next, close the windows and turn off any unnecessary electronics like car chargers, the air conditioning, and the stereo as these can draw small amounts of fuel. This entry was posted on Monday, April 15th, 2019 at 5:21 pm	and is filed under FAQ. You can follow any responses to this entry through the RSS 2.0 feed. You can skip to the end and leave a response. Pinging is currently not allowed.